‘“Antonia” has grown up on Elysium. She speaks several languages and is able to transmute into various states of matter. It is said that she has involuntarily reached immortality.’ So reads the exhibition handout. The stage is set. One can always be swept away in fiction, if you buy into its world. At Rowing, Lina Hermsdorf creates Antonia, a glimpse into her creative response to Argentinian poet Jorge Luis Borges’s 1947 short story ‘The Immortal’. Borges’s story, the first in his famous collection The Aleph, is a philosophy wrapped up in a tale, following a character who shifts between names, continents, and quests – for both immortality and mortality. Short stories are traditionally tales that can be read in one sitting, they are concise and distill an idea down to its core. In The Aleph Borges deals with the paradoxes of life, and Lina Hermsdorf’s exhibition, Antonia, dwells on this position. Hermsdorf explores ‘The Immortal’’s possibilities, and creates a mortal/immortal world of her own, exploring both the virtual and physical realms. Rowing is a beautiful space, hiding tucked away in its studio lot environment off Stoke Newington High Street. On entering the gallery, a warm pink glow affects the colour and tone of the room throughout the day and that environmental change, alongside quiet audio from speakers in the ceiling corners of the gallery, makes the space feel appropriately otherworldly – even somewhat futuristic. These physical alterations to the typical white cube shift your mind towards Hermsdorf’s desired setting – a fictional, narrative space. Lina Hermsdorf lives and works between London and Frankfurt. Her practice questions and plays with the ways we understand, comprehend and communicate. She has a background and training in theatre, and previous performances and exhibitions have told stories and dealt with diverse topics; from the myth of Hydra, to television and 'The Macy Conferences'. 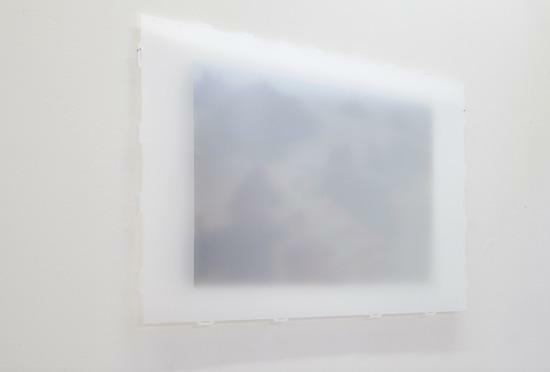 The first works that greet you are acetate sheets displaying a single line of text, overlaid with a polarised screen. The effect is that the words are warped, distant-looking – fitting for the exhibition’s contextual play on the real and the fictitious. The works are titled after the text on the sheets. They are abstract, poetic and unusual phrases: ‘No snow nor rain nor heavy storm let me try another intonation’, reads the first 94 x 54cm piece. The second; ‘She said the architecture had no purpose there should not be the slightest irregularity’, seems ironic, as each work has the layer of polarised screen meaning that the light is refracted differently for each work. The third reads ‘Your skin looks good in this light the sensation of complex irrationality’. They are the kind of semi-narrative phrases, lacking punctuation, laden with obscure references that normally drive me mad. But in this world, I suspend my disbelief. The gallery is split in two by the work that carries the exhibition’s name, Antonia. The piece is a 15min looped binaural sound work of mainly voice, accompanied by subtle ambient sounds of quiet music or birdsong. They are hung alongside a wall with a walk-through door space made from architectural glass. The audio is amazing, the mastering and binaural effect making the voice seem to seep out of a corner of the room, or be right next to your left ear. Different scenes are heard, where the protagonist has one-sided conversations and makes observations. The satisfaction comes when hearing ‘your skin looks good in this light’, and notice that the phrases from the acetate works are part of this piece. I continue to listen and get brought into the abstract, absorbing sounds. Another visitor begins to listen to the same audio with a second set of headphones hanging from the other side of the wall. Immediately the duality of the exhibition is highlighted again, I see her eyes glance to where the text on the walls reflects what she’s hearing. Lina Hermsdorf, 'Antonia', 2017 from Rowing on Vimeo. In the second half of the gallery, through the walkthrough created by Antonia, three more of Hermsdorf’s acetate works are hung. ‘You can consider this as an exercise in narrative prose certain techniques are overused for sure’ hangs next to ‘Your skin looks good in this light it kind of nicely falls upon you’. By this point the repetition of the phrases is familiar and the pieces of the narrative seem to fit together. The unspecified clauses in the acetate works reflecting sections from Borges’ story are added too Hermsdorf’s own instructions to herself for understanding the work. The repetition of the phrases make them approachable, and the final piece in the show entitled ‘screen shot’ (which looks through the polarised screen like an oil painting) fills in a visual image of Antonia’s Elysian Fields. The double element of the whole exhibition, the narrative and abstract, known and otherworldly, are made clearer through exploring Hermsdorf’s exhibition Wanderungen (the German word for ‘hikes’) on x.temporary.org. This online project could be seen as the research for her (physical) exhibition at Rowing. The site is a temporary home for works documenting Hermsdorf’s exploration of Borges’ 'The Immortal'. Three screen-recorded videos show the user selecting music, organising their screen, copying, pasting, deleting, researching, googling, while reading a pdf version of ‘The Immortal’, which is also available to download on the site. It is a great process piece – you see the logical and the seemingly random actions of someone in their own world, crafting their own story. This is the joy of x-temporary, a virtual space which makes the temporary nature of its existence into its most prominent asset. But the work doesn’t die; it is just the beginning. By questioning the existence of a virtual identity, and attempting to make it physical, does this action make the identity immortal? In this case, yes. It’s unclear which medium will last the longest, the online work or the physical pieces, but the combination makes one dwell on the elements of each, and the ideas that Hermsdorf presents. The Immortals in Borges’s story were of the opinion that: “There is no more complex pleasure than thought, and it was to thought that we delivered ourselves over.” With this exhibition, I can only agree with them. I enjoyed getting swept away by Hermsdorf’s story of Antonia.